This is a list of basic George Washington Facts. George Washington is known as the "Father of his Country." He was the Commander of Continental Forces during the Revolutionary War and was elected the First President of the United States of America. George Washington is often lauded for retiring from public life twice and returning to his farm. When King George III of England heard that Washington was going to retire as Commander of the Continental Forces, he allegedly said, "If he does that, he will be the greatest man in the world." 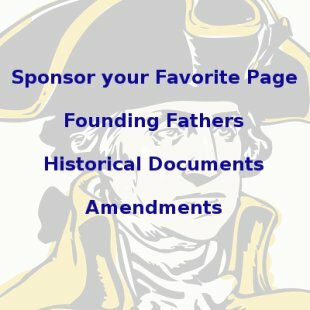 This list of George Washington Facts contains basic things such as birth and death dates, marriage date, number of children and occupations as a young man. It also contains some interesting and less well known George Washington Facts. When was George Washington born? They married in 1731. She was his second wife. Augustine Washington was a planter and was part owner and director of an iron mine. George was the fifth of Augustine Washington's ten children. The first four were mothered by Augustine's first wife, Jane Butler, two of whom did not survive to adulthood. The next six children were mothered by Mary Ball, including George, all of whom lived to adulthood, except the last, Mildred, who died in infancy. The American Cincinnatus - Cincinnatus was a Roman political figure noted for retiring and going back to his farm instead of trying to seize further political power. The Old Fox - Lord Cornwallis used this name for Washington in a remark in 1777. The American Fabius - From the writings of Timothy Pickering. Fabius was a Roman general and politician noted for his military tactics. George Washington never attended any school or college. He was educated as a child by his father and brother, and also self-educated as he became an adult. George Washington was a member of the Anglican church. He made frequent references to God and the Bible in his public statements and private letters. Personal friends and family members gave accounts of his regular Bible reading, church attendance and moral lifestyle. He personally promoted a project to evangelize Indians that was organized by Selina, Countess of Huntingdon. Washington even had a portrait of the Countess hanging in his house. The Countess was one of the leading evangelical ministers of the day. Washington was a "Low Church" Anglican, the branch of the Anglican church that took the Bible literally and would be considered "true" to the Bible by believing Christians today. Washington took only one trip outside of what is now the United States in his life. He went to Barbados with his older half-brother Lawrence in 1751. The purpose of the trip was to find relief for Lawrence's tuberculosis with the warmer weather. Married Martha Dandridge Custis on January 6, 1759. She was a widow and they were both 27 years old when they married. John Parke Custis (November 27, 1754 - November 5, 1781), known as "Jackie"
Martha Parke Custis (1756 - June 19, 1773), known as "Patsy"
John Parke Custis was raised by George and Martha Washington. He was Martha's son from her previous marriage. John married Eleanor Calvert, a granddaughter of Charles Calvert, 5th Baron Baltimore. The Calvert family was the founding family of the colony of Maryland. George Washington Parke Custis was Martha's biological grandson. He and his sister Eleanor were raised by George and Martha after their father John died. George Washington Parke Custis had one surviving daughter named Mary Anna Randolph Custis. She married Robert E. Lee, who became the Commander of the Confederate Army during the Civil War. George Washington and Robert E. Lee, Commander of the Confederate army during the civil war were third cousins, twice removed! Bushrod Washington was George's nephew, the son of George's younger brother John Augustine Washington. Bushrod and George Washington were very close, Bushrod was appointed to the Supreme Court of the United States by President John Adams in 1799, the same year George Washington died. Washington's first involvement in the resistance against Great Britain was in 1769 when he introduced a bill in the House of Burgesses calling for a boycott of all British goods. The bill was written by George Mason and was in response to the passage of the Townsend Acts, a set of laws created by Parliament that taxed imports to the American colonies. The colonists believed the acts were illegal and violated their rights as British citizens. 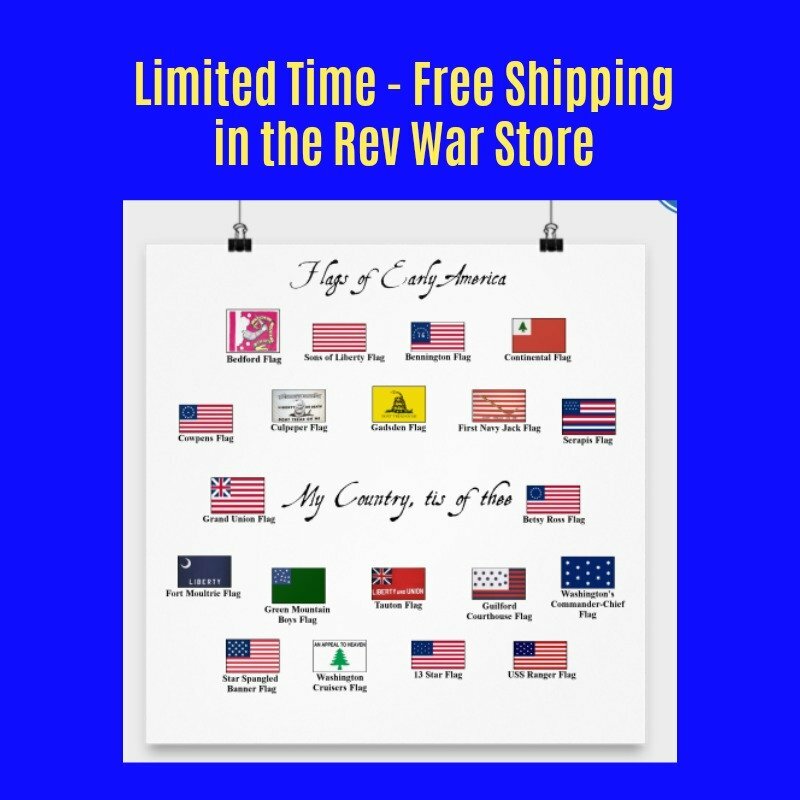 Learn more about the causes of the Revolutionary War here. Washington never formally joined a party. He was against parties because he thought they created too much division. He was, however, considered to be the informal figurehead of the Federalist party, since most of his supporters were of this party and he was in agreement with most of their positions. Appointed Adjutant General of Virginia militia - 1752, an adjutant general is the chief administrative officer of the militia, this made him a Major at the age of 20. Accomplishments of George Washington while in office? Chaired Constitutional Convention in 1789. Averted war with France and Britain in the early part of his presidency, always promoting neutrality toward conflicts between other nations. Stopped the first uprising against the Federal government, known as the Whiskey Rebellion, in 1794. By voluntarily retiring at the end of his second term, Washington established the American precedent of a non-violent transfer of power to new administrations. Oversaw creation of first National Bank. Oversaw creation of the Jay Treaty, which ended many conflicts remaining with Britain at the end of the Revolutionary War. Washington is often revered for his retiring from public service and going back to private life, rather than seeking to extend his power as many monarchs did. He was thought of as very shy and reserved. He was believed to be very humble, not even wanting positions of power. The First Congress appointed him a $25,000 salary, which he turned down, an enormous amount of money at the time. He was known for his motto, "Deeds, not words," and was not concerned about leaving a "legacy." Find more George Washington Quotes here. Rules of Civility - 1744 - This is a list of proverbs and maxims written by George when he was about 16 years old. The maxims originated in France and were used as a method of instilling social virtues in young people. "Rules of Civility" is often credited with being the source of George Washington's well spoken of virtue. Proclamation of Neutrality - April 22, 1793 - Britain and France were at war at this time and with some Americans supporting both sides. Washington was pressured to assist both sides, but refused. He issued this proclamation and held to this policy of neutrality toward the conflicts of other nations throughout his career. Due to impending war with France, President John Adams asked the retired George Washington to take command of all United States armies in 1798. Washington reluctantly agreed in order to serve his country and served in this position from July 13, 1798, until his death on December 14, 1799. He participated in the planning for a possible war with France, but the war never occurred. 'Tis well. - Spoken just before he died. George Washington became ill after spending all day December 12 on horseback in snow and freezing rain. 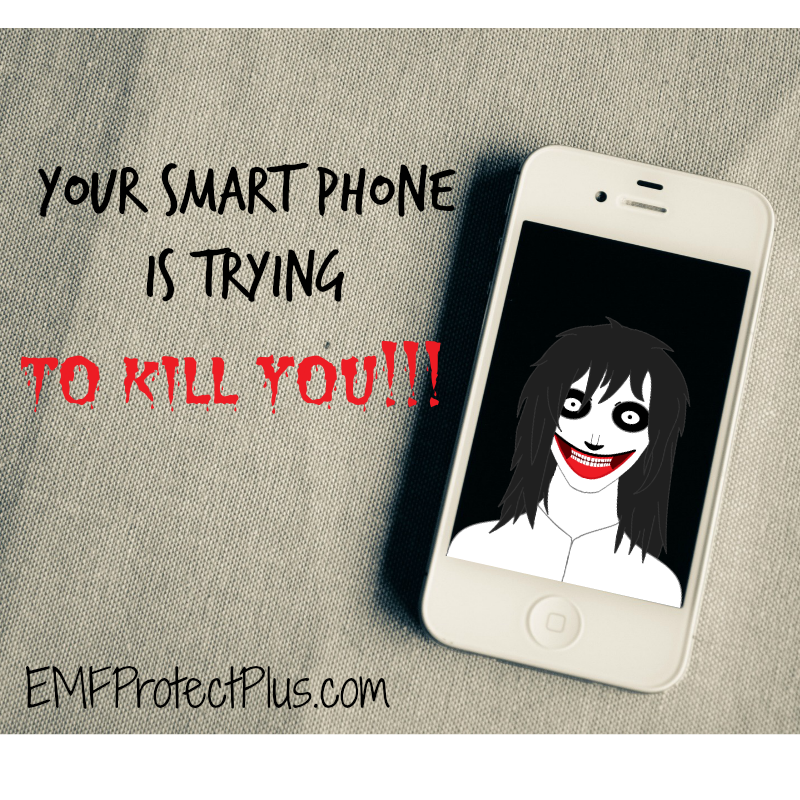 He awoke the next day with a cold, a fever and throat infection. These turned into pneumonia and possibly laryngitis. Washington apparently died of asphyxiation as a result of all these complications. Where was George Washington buried? 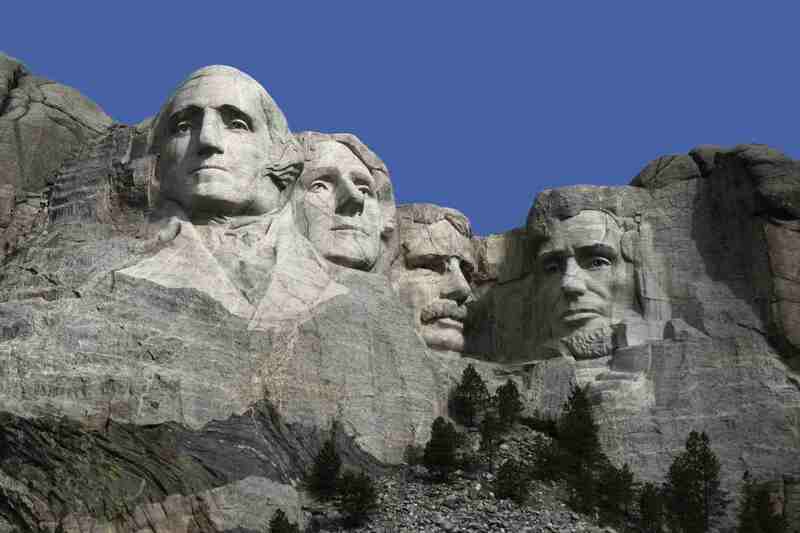 After the Revolutionary War, George Washington retired to Mt. Vernon in 1783. King George III couldn't believe it. He reportedly said about Washington - "If he does that, he will be the greatest man in the world." 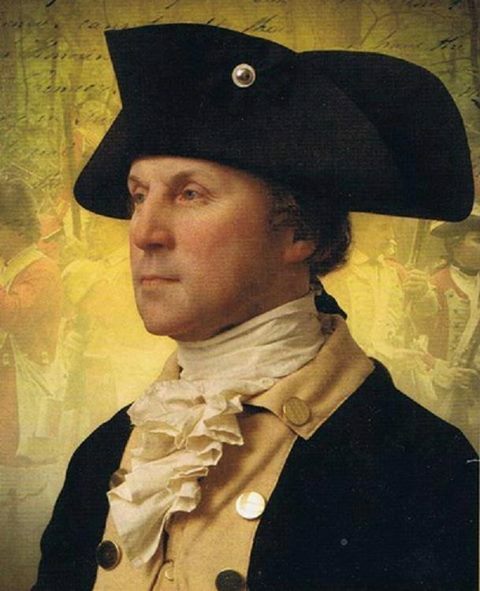 When Henry Lee delivered George Washington's funeral oration, he said this of Washington - He was... "A citizen, first in war, first in peace, first in the hearts of his countrymen." Washington DC, the nation's capital is named after George Washington. 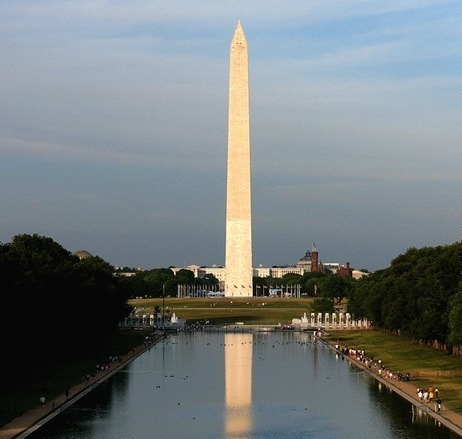 Washington Monument, Washington DC, the familiar pointed obelisk across from the White House. Mount Rushmore, near Keystone, South Dakota, features the heads of Washington, Roosevelt, Lincoln and Jefferson carved into the side of a mountain. George Washington Masonic National Memorial in Alexandria, Virginia. Mount Vernon - George Washington's famous estate near Alexandria, Virginia - you can visit the Mount Vernon website here. George Washington Birthplace National Monument - Also known as Pope's Creek Estate, features the excavated original home site, reconstructed period buildings with period furnishings and an active farm. More info about George Washington's Birthplace monument here. Ferry Farm - George Washington's childhood home near Fredericksburg, Virginia, the original structures no longer exist, but the site is an active farm and archaeological site. Find info and visiting information about Ferry Farm can be here. Christiana Campbell's Tavern - Williamsburg, Virginia, This was George Washington's favorite place to eat away from home. It is still open today! You can find out how to visit Christiana Campbell's Tavern here. 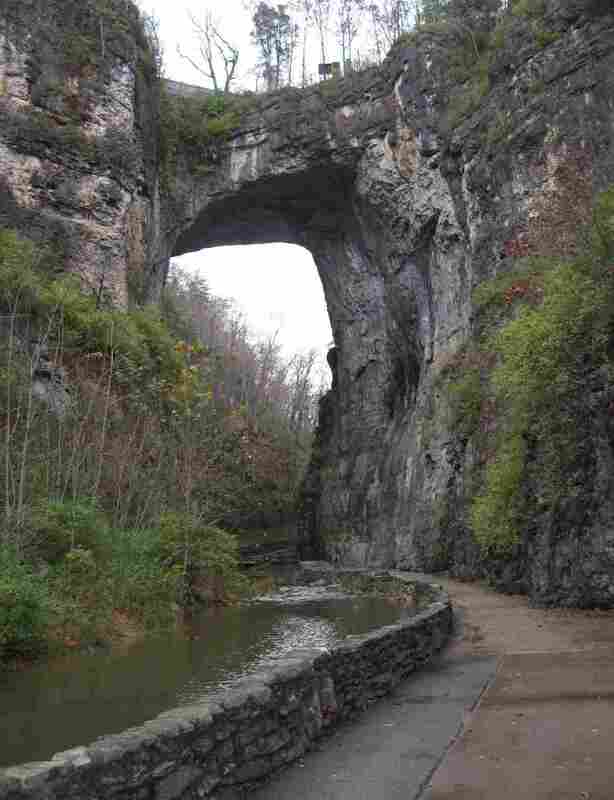 Natural Bridge - A natural Virginia landmark, also one of the Seven Natural Wonders of the World. 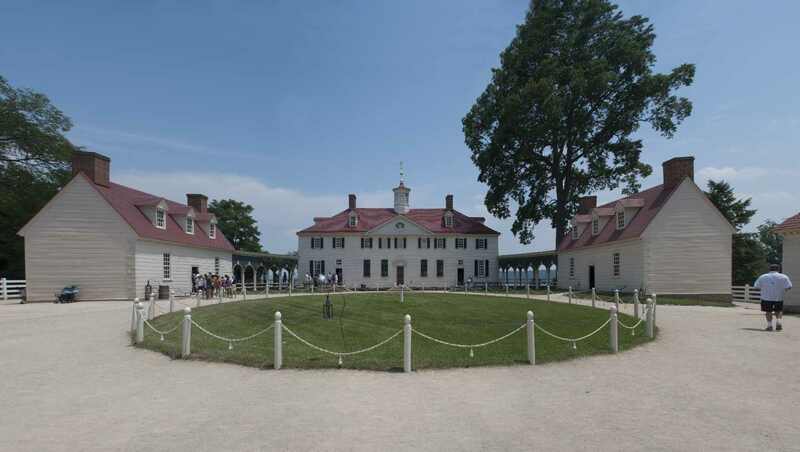 It was first surveyed by George Washington as a young man and owned at one time by Thomas Jefferson. George Washington allegedly was able to throw a rock over the bridge as well. Today it is on the National Historic Landmark registry. Find out more about how to visit the Natural Bridge here. Numerous, universities, streets and towns throughout America are named after George Washington, as well as the State of Washington. In December 1753, Governor Dinwiddie sent George Washington with a British ultimatum that commanded the French to stop their developments in the Ohio country. Washington assessed the French military strength and position and delivered the ultimatum at the French Fort Le Beouf, which is at present day Waterford, Pennsylvania. This episode was one of the events that set in motion the French and Indian war. Washington's report on the event was examined on both sides of the Atlantic, creating the first time he became known internationally. After the disastrous Monongahela expedition to take back Ohio from the French, in which General Edward Braddock was killed, Washington wrote to his brother that God had protected him, saying he had two horses shot out from under him and multiple bullet holes through his clothes! George Washington proposed to Martha Dandridge Custis after knowing her for only three weeks and meeting her only twice! Washington was nominated for Commander-in-Chief by future president John Adams on June 15, 1775. Martha Washington owned an estate called "The White House" on the Pamunkey River in New Kent, County, Virginia when she married George. Martha Washington burned all of the letters between she and George at his death to protect their privacy. Washington's likeness is featured on the American $1 bill and the 25 cent quarter. George Washington and Robert E. Lee, commander of Confederate forces during the Civil War, were third cousins, twice removed! George Washington never wore a wig as some did in that day, he did powder his hair though and wore it in a pony tail that was sometimes put in a silk bag!